3 Masters (2 w/King, 1 w/Queen & 1 Twin ), 1 w/Queen, Rec Room w/Bunk Set. Sheets & Towels Provided. 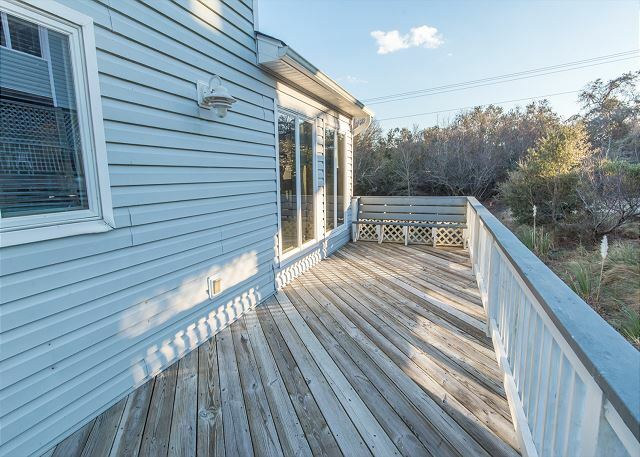 "For Shore" is a 4 Bedroom/4 Bathroom spaciously pristine vacation home which has been thoughtfully maintained and upgraded for our guests enjoyment!! This property shows and feels like a second home and is definitely not your standard vacation rental. The owners have upgraded the house from top to bottom and lives much larger than your standard 4 bedroom property. The entire down stairs has been converted to the perfect "Kid/Teen/MIL space" providing extra privacy while allowing this home to easily accommodate 2 or more families. 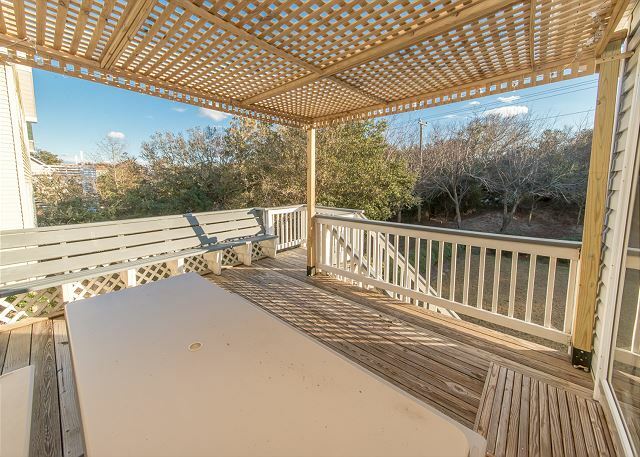 One of the best features is the fully fenced & maintained back yard which allows you to keep your pets and small children safe while outside, and the large back yard is not easily found with OBX pet friendly homes (there is even a large dog crate available for guest use). 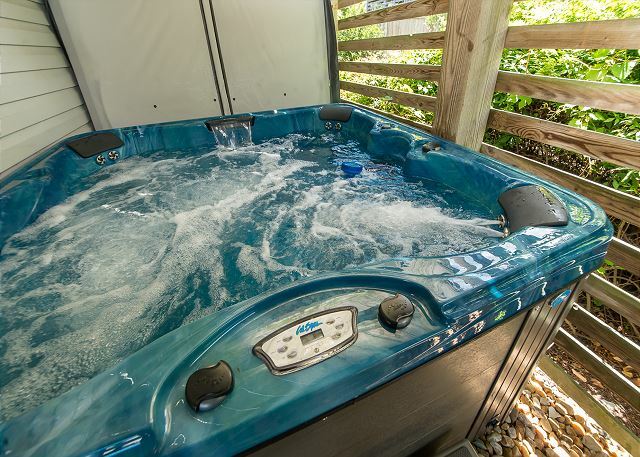 The private hot tub is the perfect oasis after a sun-drenched day of fun at the beach, and will help you unwind from the stresses of everyday "For Shore", that is what vacation is all about!!!! The fully stocked kitchen features beautiful granite counter tops, stainless steel appliances, crisp updated cabinetry, every utensil and piece of cooking equipment you could imagine to create the perfect family dinner, and the perfect kitchen island with custom overhead light fixtures. The genuine hard wood floors, which are quickly becoming a luxury of the past, provides easy clean up from kids and pets and compliments the overall sophistication of this lovely home. Off the south end of the kitchen you will find the sweetest little sun room you have ever seen, this is the perfect spot to play some evening board games or relish in your favorite novel. 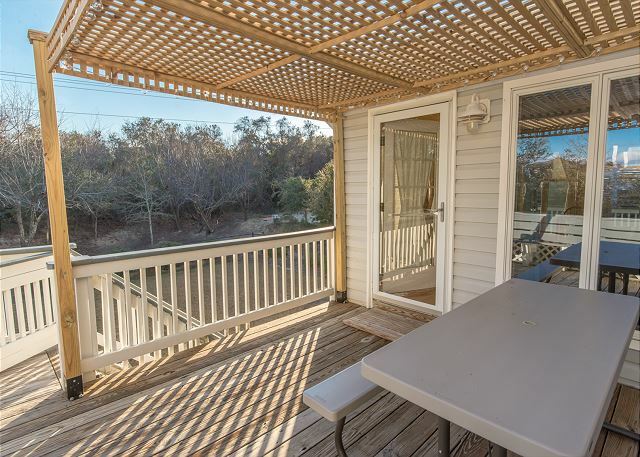 Exit through the exterior door to find a full sized picnic table, pergola, and top level access to the fenced in back yard; again providing another great area to entertain and spend time together. Everyone will admire the loft style concept leading up to the top level bedrooms where you can find the 2 King Master Bedrooms (one features a large jacuzzi tub). You will have direct walking access to the heart of Duck, NC which must be experienced at least once in your lifetime. 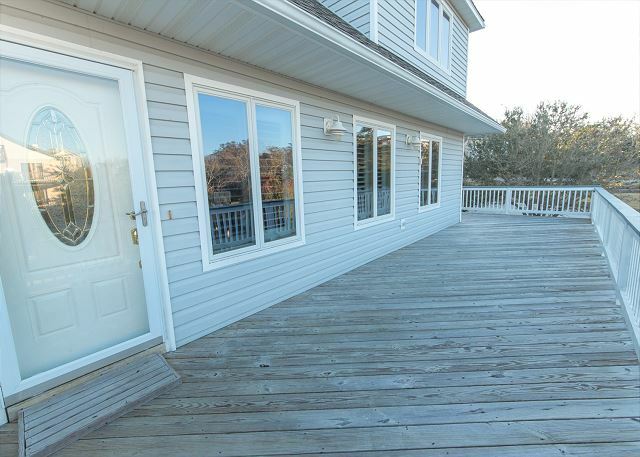 Painted with custom specialty shops along the beautiful Currituck Sound, you can stroll the board walk while enjoying a cup of your favorite ice cream or coffee. The restaurants are among the best in the Outer Banks, featuring freshly caught seafood & local cuisine some even provide waterfront dining with breathtaking sunset views. The multi-use path that parallels Duck Road will allow safe biking and walking areas for the whole family to get out and about and meet some of the most friendly people ever. Most of our guests that stay in Duck come back to Duck for all these reasons and more. Located in the Ocean Crest Community you will have access to the outdoor community pool, tennis courts, and exclusive ocean-side parking passes. Additional Amenities: New Hot Tub in 2017, Parking for Beach Access off Charles Jenkins Lane (Ocean Crest Community), Exercise Bike in Rec Room, Fenced Backyard, Large Dog Crate, Kitchen Spice Rack, Beach Toys and Games Cupboard, Large paved driveway and Basketball Hoop, WIFI, Cable, TV Surround Sound and Stereo System (main room), Highchair, Baby Gate, Beach Wagon. No telephone. 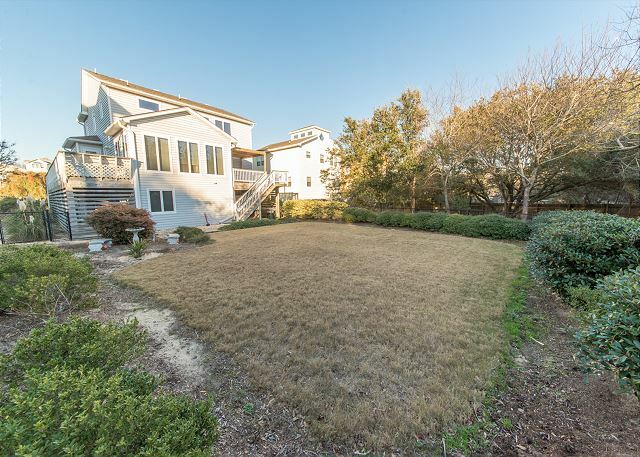 The property is approximately 0.4 miles from the Ocean Crest beach access and beach parking. 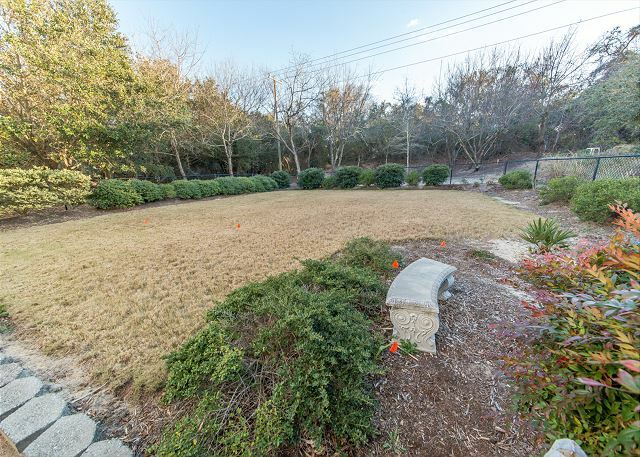 Lower Level: Fenced Backyard, Outdoor Shower, Basketball Goal. Rec Room w/Bunk Set, Foosball Table, Laundry Room with new Washer & Dryer, Master Bedroom w/Queen w/Tub/Shower, Room w/Twin & Toddler Bed (must go through Twin bedroom to access Queen bedroom), but there are sliding doors separating into 2 different rooms. Mid-Level: Kitchen w/2 Stools, Sun Room w/Flat Screen TV, Access to Deck w/Picnic Table, Dining Area w/Table, Living Room w/Gas Fireplace (off season only), Desk w/Chair, Table w/2 Chairs, Bedroom w/Queen, Full Hall Bath w/Shower. Upper Level: King Master w/Jacuzzi Tub, Double vanity & Shower, King Master w/Tub/Shower. For Shore!! Plan your next OBX vacation at For Shore!!! "Perfect" used three times surely is a great review for any rental home. We are so glad that your family chose "For Shore" and it was exactly as you wanted your vacation to be. The owners have worked very hard to make sure that the home is comfortable with all the amenities so that their guest can just come, stay, enjoy and leave with great vacation memories. We look forward to having your family join Kitty Hawk Rentals for many more vacations at "For Shore". This property if wonderful - spacious, bright, well maintained and clean. It is halfway between the ocean and the sound - both within easy walking distance. The kitchen has everything you need. The sun room is a great place to read or sit and chat with family and friends. The living room has lots of seating. The bedroom and sleeping areas were nice. The beds were comfortable. It was great having a washer and dryer and the outdoor shower worked very well for de-sanding after a day spent at the beach. We loved sitting out on the deck. There are a few plastic deck chairs - one of which need to be replaced as it is broken. The deck has gates to the stairs which was nice as we had a one-year-old with us. The bottom hinges on both gates need to be replaced. We have a wonderful family vacation here. I would highly recommend this property. "Great Place to Stay" lets us know that your family had a great time on your vacation. This house is a great vacation getaway and the owners have put a lot of thought into the amenities and functionality of the home as a whole. So they will be glad to know their guests are enjoying all of their time and efforts in planning the home. We will certainly let the owners know that they need to rethink the deck chairs for the future. We look forward to having your family with us for many more vacations in the future here on the Outer Banks. 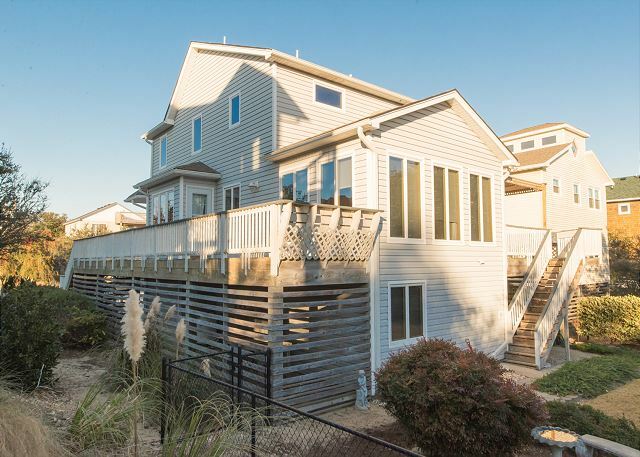 We've stayed in many houses over the past 35 years from Corolla to South Nags Head. "For Shore" definitely met our needs and then some. Lots of space and the enclosed yard was great for the dog! The house is bright, well-equipped and very comfortable. Love the location. Since it's on the south end of Duck, traffic coming in and leaving after the week was not bad. We would definitely at "For Shore" again...for sure (I couldn't resist). "Great week at the beach" is exactly what every rental company and owner desire to know from their guests after their vacation. So pleased that the house was well suited and equipped for your family and dog as well. Please join us for many more vacations here on the Outer Banks at "For Shore". This Was the perfect rental. We had no complaints and the set up and everything that was provided made the stay simple. It took 8 hours to get there and everything was in place which was great because we were exhausted. The walks to the beach were also convenient. We are very pleased that your found "For Shore" just right upon your arrival and met really all your expectations for your vacation. "Perfect Rental" is just what every owner and rental company wishes to know about a guest's vacation in one of their homes. We look forward to having your family join us again for many more vacations in the future. Everything met or exceeded our expectations! Thank you for letting Kitty Hawk Rentals and the owner of this beautiful home know everything was exactly as should be and that your expectations were not any way let down but exceeded. We look forward to having your family join us again at "For Shore" for many more vacations in the future. Thank you so much for your recent review of our property "For shore", we couldn't ask for a better review and are delighted you enjoyed your stay. 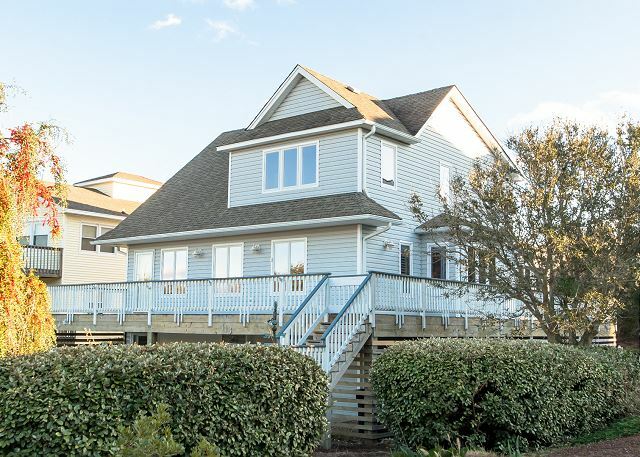 The owners will be very happy that you enjoyed your time in Duck and we really hope that you will consider booking your next trip to the OBX with Kitty Hawk Rentals. The home was in great shape with all the kitchen supplies we would ever need. No complaints about the house/yard whatsoever. Would highly recommend Collington Pizza! Very pleased to hear that "For Shore" was a perfect fit for your family's vacation. Agree Collington Pizza is very good - I had the pleasure of eating there as well! Please join us again for many future vacations at "For Shore" here on the Outer Banks. Great vacation rental! Everything we wanted and more! Loved everything about this rental! Very spacious, well equipped and loved the fenced in backyard for our dogs! Kitty Hawks Rentals and the owners are very pleased to know that your family thoroughly enjoyed your vacation at "For Shore". It is nice to come on vacation with your pets and have a place for them to enjoy as well. Please join us again in the future at "For Shore" here on the Outer Banks. The house is of great quality & in nice condition. The location is on the sound side, but it is a short walk or drive to the ocean. The staff was friendly & attentive. We had no problems connecting to the wi-fi. If you don't mind not being right on the beach, this is a fine property to consider for your vacation! Thank you so much for letting Kitty Hawk Rentals and the owner know that your family very much enjoyed "For Shore". Please join us again in the future many more vacations here on the Outer Banks.